They did it on time and professionally. The work was excellent. I think the quality of the craftsmanship was the best. They did a really good job. The job was priced right, they got it done quickly, and we were very pleased. They're reliable, consistent, and they do exactly what they promise. They're very friendly, very clean, and I am very satisfied. We had drainage work done, and they completely took care of it. They did a great job. I have actually recommended All Seasons Construction to a few of my neighbors. They were prompt, courteous, polite, and trustworthy. They do very clean, top-notch work. All Seasons Construction is a general contracting firm that specializes in foundation and drainage work for residential clients in Oakland, Berkeley, and the neighboring communities. In addition to foundation replacement and perimeter drainage/waterproofing, the company handles earthquake retrofitting, retaining walls and concrete work. All Seasons Construction’s experienced foremen supervise every job and ensure all work will stand the test of time. Likewise, says Mr. Corrallo, they work hard to build trust and lasting relationships with customers. The company’s workers are all insured employees, not day laborers, and even the most junior laborer has been on the company payroll for at least two years. 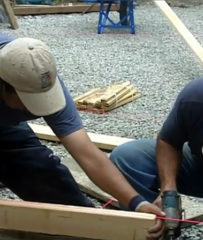 Two All Seasons Construction technicians work on a foundation project. When he took the helm at All Seasons Construction, Mark Corrallo, a former attorney and East Bay businessman with extensive experience working with construction contractors, introduced a new company objective: to provide high-quality workmanship while striving for professionalism throughout the process–from beginning jobs on schedule to working every day until they’re complete. All Season Construction’s professionalism starts with a concentration on foundation work, says Mr. Corrallo. It specializes in foundation replacement and perimeter drainage/waterproofing, but also provides retaining walls, earthquake retrofitting and decks. The company’s responsibility for customer service begins with its vice president of operations, who visits each site at least once a day and whose sole task is to serve as a liaison and executive-level contact if customers have any questions or issues that the foreman and crew can’t resolve. The responsibility continues with the foreman, who supervises day-to-day activities at the work site, and flows down to the individual members of the work crews. All Seasons Construction prides itself on professionalism, customer service and expertise. A family home is most often the biggest investment a person will make, says Mr. Corrallo, and his company is dedicated to ensuring that home rests on a solid foundation. In this economy, says Mr. Corrallo, there are a lot of contractors that will take any work that’s offered to them, even when they have no particular expertise in that area. It’s very risky to hire a non-foundation replacement expert to do foundation work. A home is the biggest investment most people will make, and a substandard foundation can severely damage the value of that investment. Not knowing whether the job was done right can undermine the peace of mind people have in their home. Because much of the work involved in foundation replacement and repair is manual labor, some contractors might be tempted to use unskilled day laborers for this work. It may save some money, but day laborers are unknown commodities. While the permanent foundation is being replaced, a temporary one has to be established to hold up the house. 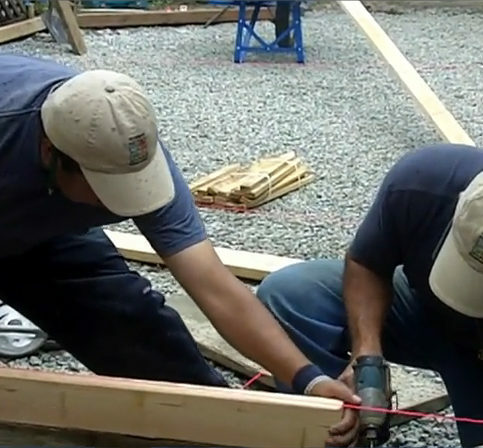 It’s important that the work crew knows how to correctly shore up a home, because improper shoring can result in severe structural damage, and even catastrophic failure. “A company should be able to vouch for every one of the workers that’s digging under your house,” says Mr. Corrallo. Drainage work is similar in this regard. Improperly installed drainage systems can exacerbate a water problem, requiring the removal or replacement of the system and repairs to the foundation. Hiring a contractor who knows and understands all the components of perimeter drainage and waterproofing can save you money in the long run. Q: How do I know my foundation needs repair? Q: How do I stop water from getting into a lower living space or a crawl space? A: In the Oakland and Berkeley Hills areas—and even in the flatlands—there’s a lot of horizontal ground water. When most of the older homes were built, there weren’t measures employed to intercept it. As a result, if allowed to flow unimpeded, the water will soak through a foundation, causing deterioration, undermining the soil underneath it, or even entering below-grade living spaces. 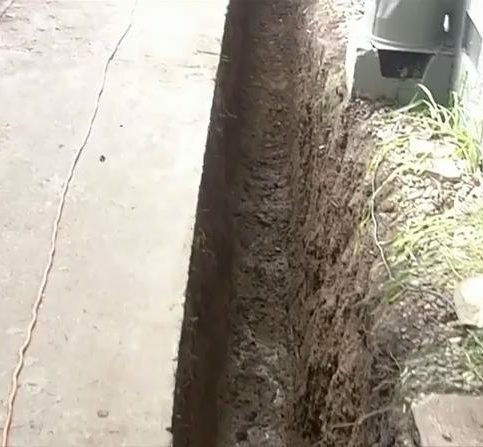 Usually, the best way to address this is a ‘French drain,’ a vertical trench that extends at least 12 inches below what you’re trying to protect, with a perforated pipe on the bottom and gravel on the top. That will give you a channel of protection to intercept the water. Q: Are plans and permits required for a job? A: Foundation jobs always require plans and permits. Some jurisdictions require permits for drainage jobs, but others don’t. Even if they’re not required, we recommend you get them, because it shows our work has been reviewed by a city inspector and has been completed pursuant to the plans. It’s also helpful information to have if you ever want to sell the house. All plans and permits are included in any proposal we give you. Q: What kind of supervision do your crews have? A: You’ll be assigned a foreman who’ll meet you at the job site the afternoon before the job is expected to begin. Your liaison throughout the course of the project will be our vice president of operations, who’ll visit the job site daily and be available to answer any questions or concerns you have, either in person or by cell phone. Q: Why don’t you have an engineer on staff? A: It serves everyone’s interest that we don’t. If an engineer was on our payroll, you wouldn’t know whether or not the assessment was motivated by professional judgment or financial gain. We prefer to work with independent, third-party engineers who have no financial stake in the work they’re recommending. Q: How long do foundation jobs typically take? A: That really depends on the scope of the particular job. But we’re committed to moving through a job as quickly as possible, and we don’t pull resources off your job to finish someone else’s. From the day we start to the day we’re finished, we have a full crew on site, working toward completion. Q: What exactly does earthquake retrofitting entail? A: Proper earthquake retrofitting usually involves two types of work, plus a third that’s sometimes required. The first is making sure the foundation is bolted to the framing of the house. This is done by bolting the mudsill that runs around the perimeter to the foundation, so when the earth and foundation move, the mudsill moves with it.The second is to install sheer paneling—structural plywood that’s nailed on four sides to the mudsill. When the mudsill moves, the house will move vertically with it instead of being jerked in a parallelogram or whipping motion. The third comes into play when you have a ‘soft story,’ where the supporting walls aren’t up to the task of supporting the living space above. This is often the case with living spaces above garages, where the garage door has replaced the studs that would normally support the upper story. There are various ways to address a soft story, such as additional sheer paneling or supporting columns, but each situation is different and requires an engineer’s assessment. Q: Do I need a concrete retaining wall? A: It depends on how high the wall is and how much weight it will have to withstand. If the wall is less than three feet high, you have a number of options, some of which are quite decorative. For example, you can use stacked decorative blocks or a wooden wall. But concrete is the longest lasting, and we recommend a reinforced concrete wall for any load in excess of three feet high. A large retaining wall isn’t simply a wall; it’s actually an L-shaped structure with the base extending downhill about half the length as the wall is high. A four-foot vertical wall has a two-foot horizontal counter footing. When planning for such a wall, you have to be sure the property line, trees, sidewalks, and other factors leave enough room for this counter footing. All Seasons Construction provides general contracting services. All of the company’s workers are insured employees. All Seasons Construction specializes in foundation and drainage work. Mark Corrallo is president of All Seasons Construction, a Diamond Certified company since 2007. He can be reached at (510) 652-2221 or by email. A resident of Alamo (where he lives with his wife, Hui Ling, and son, Jaedi), Mark spends his time outside of work engaged in a variety of interests, from classic cars to sports. “I’m a classic car enthusiast, and I have a collection of about a dozen English, Italian, and American models,” he says. “I spend way too much time buying, selling and reading about cars. I also like playing pickup basketball and following the Golden State Warriors and San Francisco Giants.” Additionally, Mark enjoys going to the beach, taking bike rides and skiing at Tahoe with his family. A: A 1971 Ford Mustang Fastback. A: I’ve owned almost every one of my dream cars. I guess the one that has remained out of reach is the Mercedes-Benz 300SL Gullwing. Those are in the seven-figure range and I’m not sure I’ll ever be a seven-figure guy. A: The guitar. I play a little already, but I’d like to be better at it. A: Surfing the Banzai Pipeline in Hawaii. 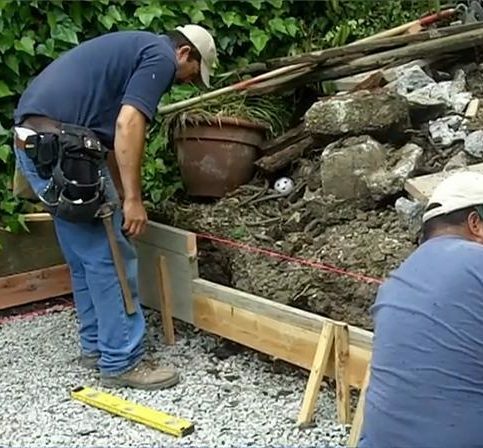 OAKLAND — Due to concerns about earthquake safety, many Bay Area homeowners are taking preemptive action by having their homes retrofitted via measures like foundation bolting and bracing. While retrofitting is a great idea, there’s one caveat: if your home’s foundation is poor or weak, bracing and bolting won’t do much good. For example, when an earthquake strikes, a bolt that’s anchored in weak concrete could easily snap out of the side of the stem wall, which eliminates any of its intended benefits. The best way to avoid wasting your money on pointless retrofitting measures is to hire a quality retrofitting company—preferably one that also handles foundation work. A company that doesn’t do foundation work may not be able to provide all the services you need or even inform you about them, but a well-regarded retrofitting company will give you the straight scoop and provide everything you’re looking for. OAKLAND — Host, Sarah Rutan: If you’re planning to have your home retrofitted for earthquake safety, don’t overlook the importance of a firm foundation. Today we’re in Oakland with Diamond Certified Expert Contributor Mark Corrallo of All Seasons Construction to learn more. Diamond Certified Expert Contributor, Mark Corrallo: In this area, a lot of people are concerned with earthquake safety, and they will seek out a retrofitting company to bolt and brace their home, which is a good idea. But the problem is that if the foundation to which they’re bolting is poor or weak, there’s very little value in the retrofitting. For example, if a bolt is anchored in weak concrete, in an earthquake, it could snap out the side of that stem wall, providing very little benefit. Now, the problem is that a lot of the retrofitting companies do not do foundation work, so they don’t really have an incentive to tell you to stop. It’s probably a good idea that you call somebody who does both foundation and retrofitting, so you can kind of get the straight scoop on exactly what you need. Jeremy Ke is operations manager of All Seasons Construction, a Diamond Certified company. He can be reached at (510) 652-2221 or by email. A: Italy. That’s where my wife and I met, so it’s a pretty special place for us. Plus, there’s a lot of great cycling there. A: A cat person—we have two. A: I’ve read “To Kill a Mockingbird” and “The Lord of the Rings” trilogy a couple of times each. Q: The Beatles or the Rolling Stones? OAKLAND — Groundwater issues are a major concern in the Oakland/Berkeley area. Following heavy rains, the water that saturates the hills starts to move downward, eventually making its way toward the bay. As it travels, this water encounters a lot of home foundations. On vulnerable properties, water may be able to penetrate the foundation and seep into the crawlspace. Over time, this recurrent water intrusion can result in major damage to these below-grade areas of the home. These are all indicators that water is getting into your crawlspace through your foundation. If you notice one or more of these issues, have a drainage professional take a look at your home. Often, this kind of issue can be remedied by installing French drains on either side of the home, which will prevent water from getting into the crawlspace. OAKLAND — Host, Sarah Rutan: Following heavy rains, it’s a good idea to inspect your home’s foundation and crawlspace for signs of water intrusion. Today we’re in Oakland with Diamond Certified Expert Contributor Jeremey Ke of All Seasons Construction to learn what to look for. Diamond Certified Expert Contributor, Jeremey Ke: Groundwater issues are a major concern in the Oakland and Berkeley area. We get a lot of water in our hills that saturate the ground, and that water wants to make its way through the ground, out to the Bay eventually. On its way, it often encounters a lot of home foundations and makes its way through the foundation and into the crawlspace. And over time, this could be a major concern for damage to your crawlspace and damage to your foundation. We strongly recommend that homeowners, after heavy periods of rain, do an inspection of their foundation and crawlspace, and look for signs of water intrusion. And those signs may be white efflorescence that makes its way around the perimeter of the foundation but also on the crawlspace itself. 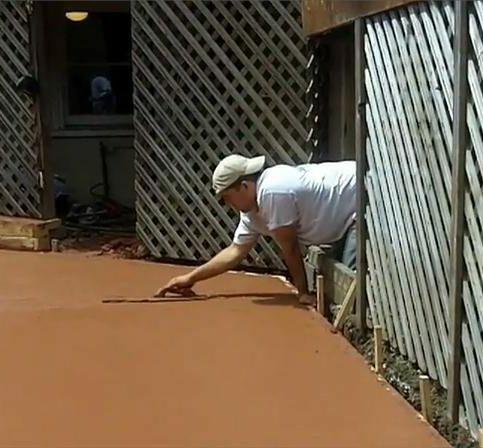 You may see cracks in the ground, in the foundation, that show that the water has saturated during heavy periods of rain, but later dries out, leaving cracks looking like a riverbed. Sometimes in the home, you get a musty smell from wet earth under your home. These are all issues that you have water coming into your crawlspace, through your foundation, and indications that you want to have a professional come out and take a look at your home. And oftentimes, these can be remedied just by a French drain on two sides of your home, preventing water from intruding into your crawlspace. All Seasons Construction : Average 8.7 out of 10 based on 276 unique customer surveys of customer satisfaction. They worked with us to get a project done that was very time sensitive and squeezed us in between some other projects they had. It went very well. Mark Corallo was really good at setting it up, the crews were hardworking, friendly and the job was done in a timely manner. Very good crew chief leads, they were very open talking to me everyday and keeping me up to date on what was going on. That was very enjoyable in an otherwise disruptive process in my house. They are reasonably priced and good people. They were easy to work with, highly competent and easily reachable. They did little extra things without us having to ask. I really appreciated working with Jeremy. They work hard and quickly and I was very happy with the price. I would recommend them. The fact that they were able to solve my ongoing problem for the past three to four years that other contractors were unable to. I really appreciated everything they did. I would tell them to consider them and get a bid. Their day to day contact person, Jeremy, was very on top of things. They were referred to me from a contractor that I used. I highly recommend them. They are top-notch and very incredible. The sales guy was incredible, the foreman was really incredible and the price and product were reasonable. They were efficient, courteous, clean and thorough. They have great people and did excellent work. Jason, the project manager was great and the guy below him. They were professional, did excellent work and it is working. They are very reliable, showed up on time, good communication and very efficient. The quality of their work is very high. They were honest and reliable. Honestly, I don't know. I don't remember as it was a while back. I know we were happy though. Just good quality, the price was fair, and they were on time with the job completion. They are really professional. They were good about giving me updates. I thought they did good work, very responsive. They followed through with what they said. They were attentive and responded quickly. Mark was very responsive and quick. His crew was very good and great about cleaning up afterwards. The crew was really nice. It was a very positive experience.